Take Two is a recurring column in the New York Times Style Magazine where two celebrities go head-to-head reviewing a short list of curated products. 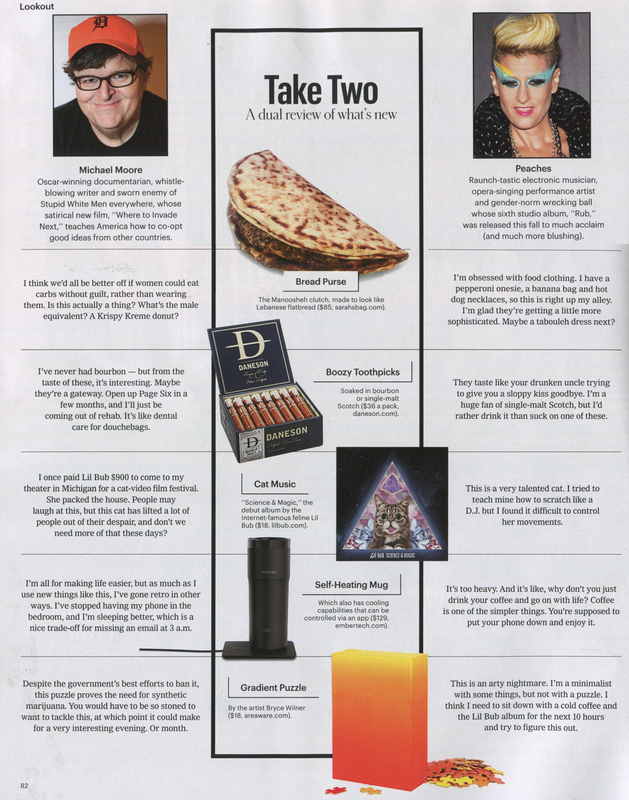 Last weeks column featured Michael Moore and Peaches in reaction to our Gradient Puzzle by Bryce Wilner. Michael Moore - "Despite the government's best efforts to ban it, this puzzle proves the need for synthetic marijuana. You would have to be so stoned to want to tackle this, at which point it could make for a very interesting evening. Or month. Peaches - "This is an arty nightmare. I'm a minimalist with some things, but not with a puzzle. I think I need to sit down with a cold coffee and the Lil Bub album for the next 10 hours and try to figure this out."